1. Soak the client’s feet for five minutes in a pedicure bowl with warm water and the key lime bath bomb. Perform nail care and cuticle work. 2. Dry the feet and drain the pedicure bowl. Lightly buff the nails and apply Gelish Foundation and cure. Apply two coats of color, curing between each. Add Dazzler Top Coat and Polymer Key Lime decals as shown. Finish with Gelish Top It Off. 3. Refill the pedicure bowl. 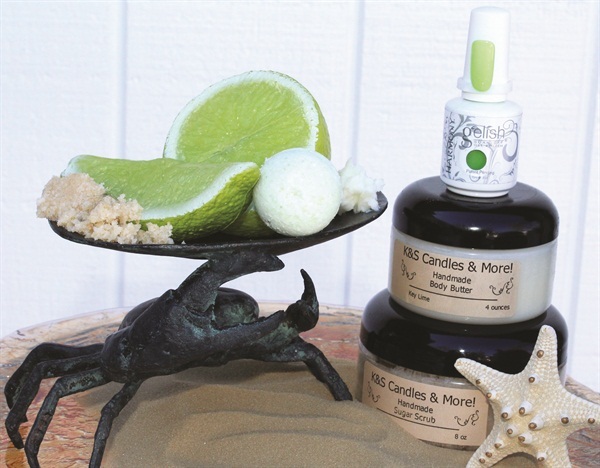 Immerse the feet and apply Key Lime Exfoliating Sugar Scrub. Rinse and dry the feet and apply cuticle oil. 4. Massage Key Lime Body Butter onto the feet and legs. Wrap the feet in warm towels until the moisture is absorbed. 5. Cleanse the nails to remove residue and reveal the finished pedicure. Tweak this Recipe: Use an alternate name such as Citrus Soothing Pedicure and offer a chilled glass of limeade.